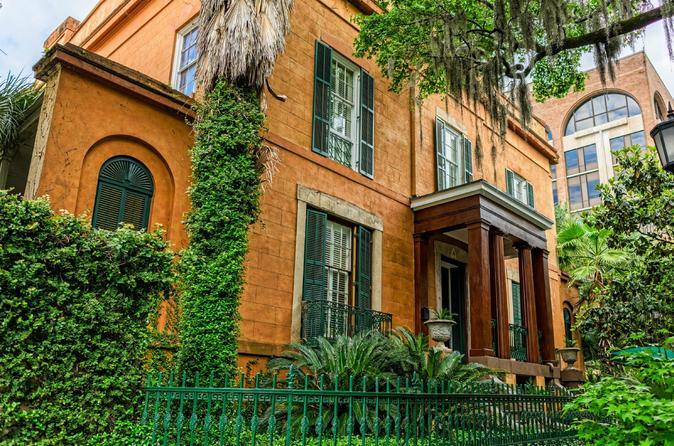 Conquer your fears and explore Savannah’s most haunted house on a 2-hour night tour of Sorrell Weed House and Colonial Park Cemetery. Having been featured on popular TV shows such as ‘Host Hunters’ and ‘Ghost Adventures’, Sorrell Weed House has a confirmed record of high paranormal activity, increasing your chances of a supernatural sighting. Stroll through Savannah squares under the cloak of darkness and visit Colonial Park Cemetery, where restless souls allegedly roam. Small-grou tour limited to 15 people. Expereince the paranormal activity of locations featured on hit TV shows 'Ghost Hunters' and Ghost Adventures"
At either 7 or 9:30pm, make your way to Sorrell Weed House, located at 6 West Harris Street, and greet your ghost hunter guide. As you stroll through the darkened squares of Savannah, listen to chilling tales of the town’s dark history. In Colonial Park Cemetery, peer between headstones in search of restless specters and discover the lives and deaths of former Savannah residents. Then, proceed to the crowning feature of Savannah’s supernatural scene: Sorrell Weed House. Shrouded in more than 100 years of history, the colonial mansion has witnessed tragic deaths and an abundance of paranormal activity. Follow your guide through the house, listening to tragedies that surrounded memebers of the Sorrell family. Throughout the tour, use your EVP (electric voice phenomenon) and infrared cameras to detect supernatural presences in areas such as the basement and the carriage house, where a servant was found hanging from a noose.